Adventuring safely is our priority – please help us reach our goals and keep yourself and those around you focused on safe use of our facility. Every Member and Guest at recROC MUST have a completed safety waiver on file. Waivers must be renewed every six months, and can be completed here online or in person. Age restrictions: Children under age 14 must be accompanied by an adult and supervised at all times. 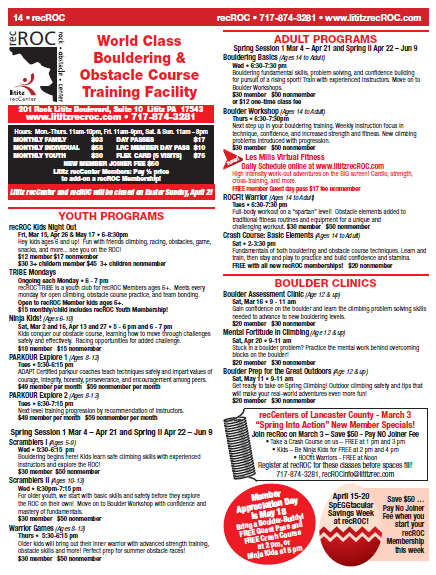 Children under the age of 8 may not use the Obstacle Course/Ninja Obstacle equipment. Waiver: All participants must sign a waiver. Parents/Guardians must sign a waiver for children under the age of 18. Participants under the age of 14 must be accompanied and supervised by an adult (18 years and older) at all times. Sign a WAIVER. Please watch our safety video below! Please note that recROC staff have the right to refuse entry to any person – member or guest – whom they determine to be unable to abide by safety guidelines. Refusal to abide by safety guidelines may result in dismissal from the facility, loss of Guest privileges, or loss of Membership.